Finally time for a another quick installment of "The houses and jobs in my village"- series. I totally lost count of where we were on this and I actually had to go back and count it, so it turns out this will be no. 9. Today the Meadows family will get their turn. They were the 31st family I got and I love them. The twins I traded from a fellow collector in Ireland and the parents came all the way from the USA. At first I was unsure what they will do and where they will live. For most of his life Jack has lived in The Big City, where he had done odd jobs since he was a young adult. When he met Maisie he got a more secure job and although the pay was low it was steady. It was on one of their annual vacations that everything changed. The entire village of Sugarbush Valley opened their arms and their hearts to this new family and now they are happily living in the village. 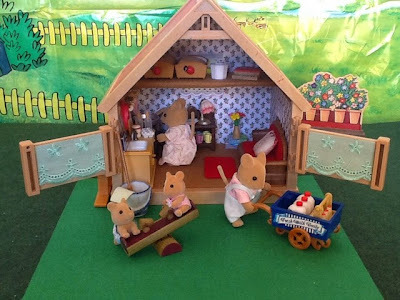 So lets take a look at their home, which is a Sylvanian stable which I changed into a home for them. 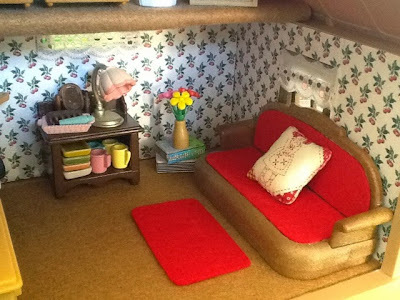 Front view of the small, but cosy home. A closer look at the living room area. At night time the "sleeper"-couch are unfolded to reveal a comfortable bed for Jack and Maisie. 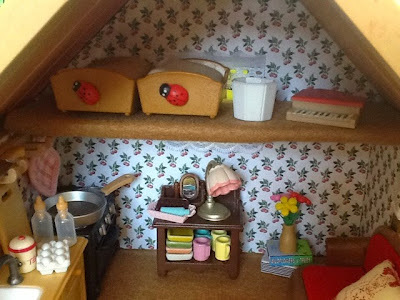 Jack and Hornbull cleverly assembled a shelf or small attic, where the twins' cots are kept during the day as well as other ods and ends that they want out of the way. 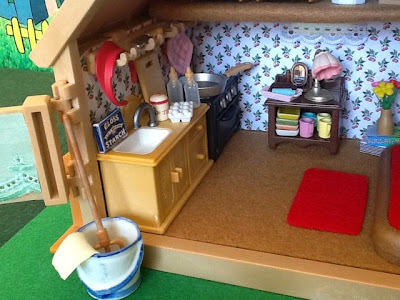 Jack and Maisie love their small but cosy refurbished stable-home. Jack was employed by Hornbull Buttercup as a farm worker. He mostly delivers fresh milk daily to the Villagers. Maisie is helping Daisy at the Ice Cream cart. 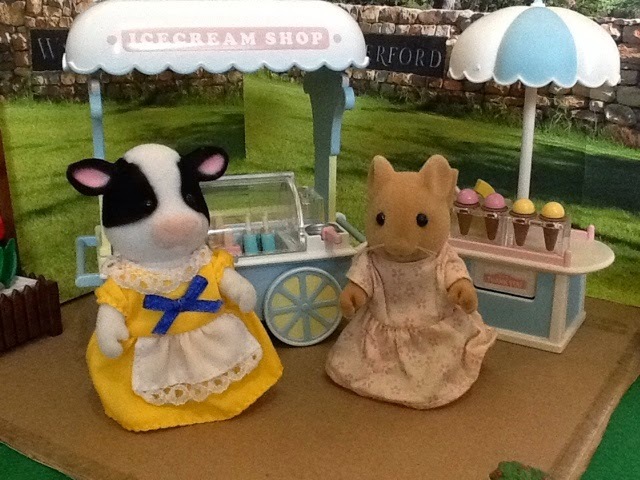 It quickly became evident that making ice cream, selling it and being a farmer's wife, not to mention mothering 5 children, has become a bit too much for Daisy and having a right hand in the person of Maisie has surely rescued Daisy from a nervous breakdown. Also go to "The-Houses-of-Sugarbush-Valley" and "The-Villager's-jobs" for more. Lastly I have to, but also want to mention my friend Sigrun who gave me the idea of decorating a stable as a home. Visit her fantastic site here! 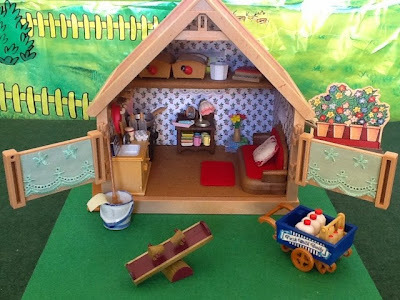 What an adorable home you have made for the Meadows family! Your utilisation of the space provided is clever and practical, yet cosy. I have checked out Sigrun's site, and am now very interested in the lovely MV. Sigrun has an amazing site, thanks for checking that out! And also thank you for the kind comment about the stable! They are so cute and the stable fits them perfectly and fills all their needs. I love how you decorated it. Again I'm really impressed, how you managed to put all needful furniture in thst small house. And it looks so comfortable and cozy. The meadows are such a cute family! I'm glad they found such a nice home. You did wonders in that tiny house! What a fantastic job! And I said it before but I'll say it again, that red sofa looks amazing! 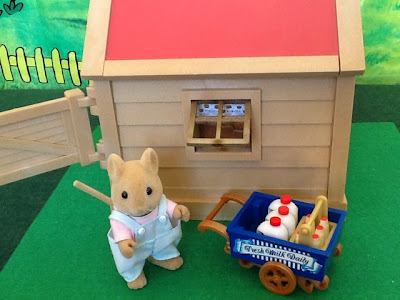 Your meadows mice are spoiled to have a beautiful house. I think the baby look super adorable! Thank you for the wonderful comments, Im blushing and appreciate it! I have come to love decorating these small houses!!! Thx for the comment! Their new home looks very cozy and practical :) What a change from a stable! Good that Meadows family is now settled in Sugarbush.